The challenge on this project was to create a media kit to showcase the full line of new Audi vehicles and highlight the new high-tech retractable navigation system to the international press. 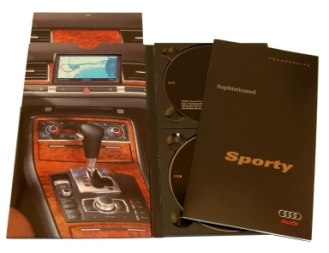 Audi required the kit to contain low and high resolution images in jpg format with printed images for reference, as well as press releases, technical specifications and equipment lists. Additionally, Audi wanted the design to emphasize the new high-tech retractable navigation system. YES was involved in this project from the design phase through the final assembly and finishing phase. YES worked with the designer to develop a stylized kit that would contain the required components. --Two CD carriers were inserted to hold the CDs that contain the documents and jpg files. The CDs were specified to maximize functionality and for space efficiency. --A pocket was created on the inside front cover to hold the brochure that illustrates the jpg images and references the CD contents. --To highlight the sophistication and sporty nature of the Audi, and its new navigation system, the console and dash were printed on the inside front cover. The console and dashboard printed above create a 3-D look. --The pull tab at the top of the brochure reveals the in-dash navigation system. The design firm that produced this project for Audi was thrilled with the end result. The bottom line is the kit was well received by the international press.